The Mumbai and Delhi airports both tied for number two slot along with Singapore's Changi to be rated as the second best airport globally in the `over 40 million passengers per year' category at the Airport Service Quality Awards 2016 conducted by the Airports Council International. Seoul's Incheon took the number one rank as all the three were ranked the second best airport globally in the `over 40 million passengers per year' category. ASQ is a global benchmarking programme measuring passengers' satisfaction while they are travelling through an airport. Every year, the programme delivers some 600,000 individual surveys in 41 languages in 84 countries. 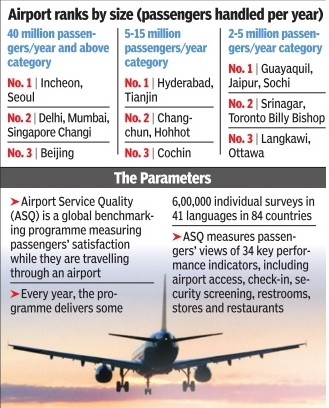 Cliched though it may sound, but Indian airports have passed with flying colours in the ASQ awards this year. The Jaipur airport shared the top rank along with Guaya quil (Equador) and Sochi (Russia) airport in the `2-5 million passengers per year' category . Srinagar airport came second in the `2-5 million passenger category' along with Toronto Billy Bishop airport. In the `5-15 million passenger per year category', Hyderabad airport shared the top slot with Tianjin airport (People's Republic of China), while the Cochin airport came third in this category. The `over 40 million passenger' category in which Mumbai and Delhi took the number two rank is the highest category in terms of passenger size. ASQ measures passengers' views of 34 key performance indicators, including airport access, check-in, security screening, restrooms, stores and restaurants. Each airport uses the exact same survey , creating an industry database that allows airports to compare themselves to other airports around the world. ACI has 623 members operating 1,940 airports.